Things are stirring in the Bernese Jura! Last Automn 2003 and Spring 2004, in the Bernese Jura, two old funiculars were completely replaced and modernized! The funiculars of Saint Imier and Ligerz were built with the same technology, both of them were composed of two counterbalanced cars moving a single track line with a passing loop. Both of them were about hundred-year-old and were at end's door... For economical reason, during the last years, both of them were operated with only one car and one conductor, the second cars did not take passengers and were only used as counterweight. Today, the two funiculars of Saint Imier and Ligerz are both composed of one car moving on a single track without passing loop and a winch at the upper station. The rebirth of Ligerz's funicular! The funicular Ligerz Tessenberg Bahn was slowly dying for several years. It was operated with only one car instead of two because of economical raison, the equipments were suffering from wear and tear and were at death's door. It was going to be definitively stopped but fortunately it was decided to save the funicular! The only way to save it was to merge the LTB company with Aare Seeland Mobil AG company which operates public transportations (trains, buses, boats) in the Bien Lake area. It was done on June 21th, 2003. It was decided to stop the funicular and start the work for a new one at mid-October 2003... but it did not turn out as expected... on mid-September 2003 a serious technical hitch (wearing effect on a gear) definitively stopped the funicular. The work for the new funicular started on end of September 2003 instead of mid-October... two weeks before the day planned! 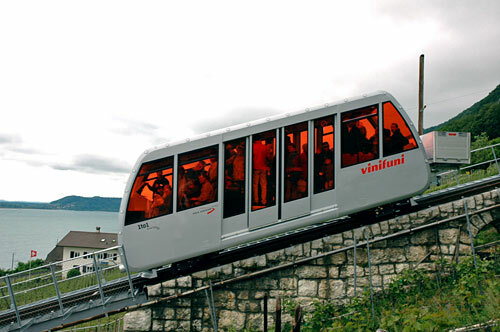 The new funicular was unveiled on May 17th, 2004 and opened to the public on May 22nd, 2004. The new car on 22nd May 2004. 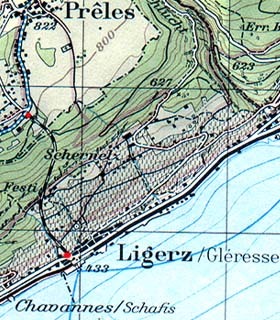 The funicular Ligerz - Tessenberg Bahn was first opened on 8th June 1912 to link the small village of Ligerz to the Diesse plateau (Tessenberg) and one year after, 9th June 1913, the CFF (Federal railways) unveiled the new train station at Ligerz. The funicular was synchronysed to the CFF train schedule. It was a classical funicular, 2 counterbalanced carriages running on a single track with a passing loop at mid-course. The first carriages were made of wood, they were replaced in 1949 by two new carriages made of aluminium. One of the two aluminium carriages, in May 1988 , in the vineyards. 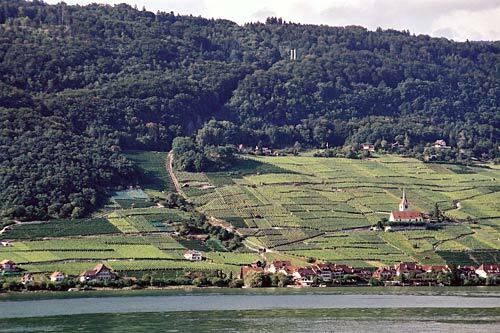 The splendid site of Ligerz on the Bienne Lake. 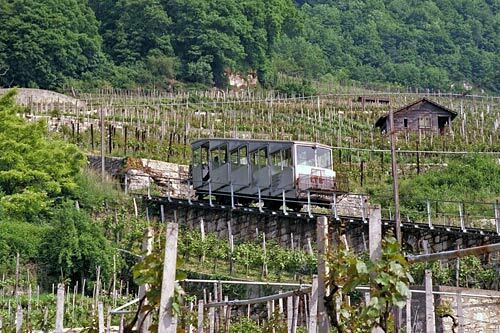 The funicular follows a big S thru the Ligerz and Schafis vineyards. On the right the lovely church of Ligerz... my favorite place in Switzerland!!! Signpost at the Pilgerweg stop in December 2003. 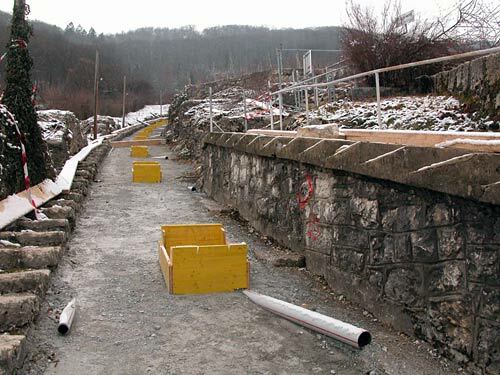 The Pilgerweg stop during the work of the new funicular in December 2003.